A new jet-lag mobile app called Entrain released by University of Michigan mathematicians reveals previously unknown shortcuts that can help travelers entrain (synchronize) their circadian rhythms to new time zones as efficiently as possible. Entrain is built around the premise that light, particularly from the sun and in wavelengths that appear to our eyes as the color blue, is the strongest signal to regulate circadian rhythms. These fluctuations in behaviors and bodily functions, tied to the planet’s 24-hour day, do more than guide us to eat and sleep. They govern processes in each one of our cells. The study, published April 10 in Public Library of Science Computational Biology (open access), relies on two leading mathematical models that have been shown to accurately describe human circadian rhythms. The researchers used these equations and a technique called optimal control theory to calculate ideal adjustment schedules for more than 1,000 possible trips. The app gives users access to these schedules. Start by entering your typical hours of light and darkness in your current time zone, then choose the time zone you’re traveling to and when, as well as the brightest light you expect to spend the most time in during your trip (indoor or outdoor.) 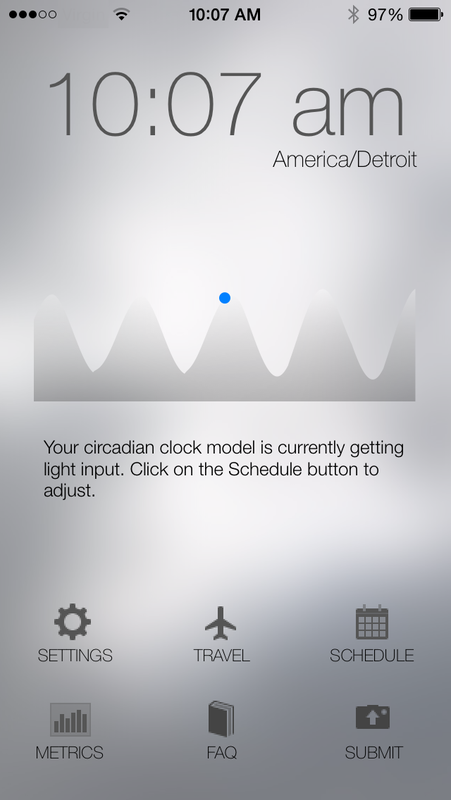 The app offers a specialized plan and predicts how long it will you take to adjust. The shortcuts the app offers are custom schedules of light and darkness depending on the itinerary. The schedules boil down to one block of time each day when you should seek the brightest light possible and another when you should put yourself in the dark, or at least in dim light. You don’t even have to be asleep. If you must go outside, you can wear pink-tinted glasses to block blue wavelength light, the researchers say. And if the app prescribes “bright outdoor light” in the middle of the night, a therapeutic lightbox can do the job — yes, its shortcuts sometimes require odd hours. The Entrain app is available now as a free app in the Apple store. Say you’re traveling from Detroit to London, five hours ahead. Your flight leaves at 10 p.m. Eastern Time and arrives at 11:05 a.m. London time the next day. It’s a work trip and you’ll have to spend most of your time in indoor lighting. Under those circumstances, the app says it can adjust you in about three days. That’s less than the rule-of-thumb one day per hour outside the starting time zone. The entrainment clock for any trip starts at the beginning of the first light cycle in the new time zone. So for the London trip, on the day after your arrival, you’d want to get light from 7:40 a.m until around 9 p.m., and not after. Rise earlier on the second day, at 6:20 a.m. Lights out at 7:40 p.m. You may feel like going for an evening walk, but being in the light at a time when the app prescribes darkness would lengthen the adjustment period, the researchers say. The new iPhone app is based on new findings by Forger and Kirill Serkh, a doctoral student at Yale University who worked on the project while an undergraduate at U-M.
Jet lag arises from a misalignment of circadian biological timing with the timing of human activity, and is caused by rapid transmeridian travel. Jet lag’s symptoms, such as depressed cognitive alertness, also arise from work and social schedules misaligned with the timing of the circadian clock. Using experimentally validated mathematical models, we develop a new methodology to find mathematically optimal schedules of light exposure and avoidance for rapidly re-entraining the human circadian system. In simulations, our schedules are found to significantly outperform other recently proposed schedules. Moreover, our schedules appear to be significantly more robust to both noise in light and to inter-individual variations in endogenous circadian period than other proposed schedules. By comparing the optimal schedules for thousands of different situations, and by using general mathematical arguments, we are also able to translate our findings into general principles of optimal circadian re-entrainment. These principles include: 1) a class of schedules where circadian amplitude is only slightly perturbed, optimal for dim light and for small shifts 2) another class of schedules where shifting occurs along the shortest path in phase-space, optimal for bright light and for large shifts 3) the determination that short light pulses are less effective than sustained light if the goal is to re-entrain quickly, and 4) the determination that length of daytime should be significantly shorter when delaying the clock than when advancing it.